No matter your genre preference, LA's got an active music scene for your taste -- and probably has a totally free ongoing night that'll please you, aurally. Here are LA's best free ongoing music nights, organized by genre (we purposefully left out summer-only outdoor concert series, but we'd love to hear anything else we missed in the comments -- we searched far and wide for free live hip-hop and came up short, so if you know anything there, please let us know). 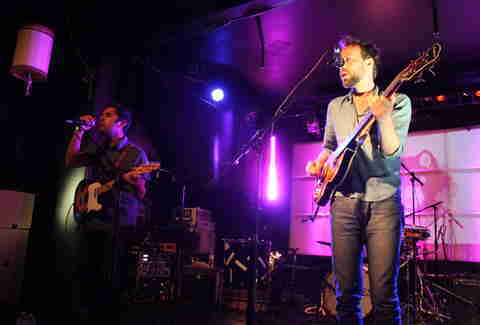 The granddaddy of LA's indie-rock residencies also has its best track record -- Local Natives and Silversun Pickups are among the bands that have gone national since playing the dark club's free-music nights. 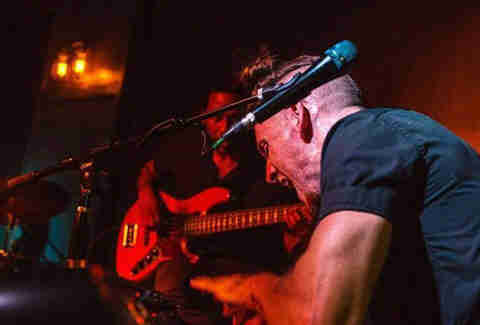 For over a decade, the Echo's also been on the front of every LA's hipster's tongue; their Monday-night residency's hosted future stars like Foster The People when they were in their local-band infancy. Grouplove shook this small club every Monday for a while -- and have been shaking KROQ's playlist ever since. 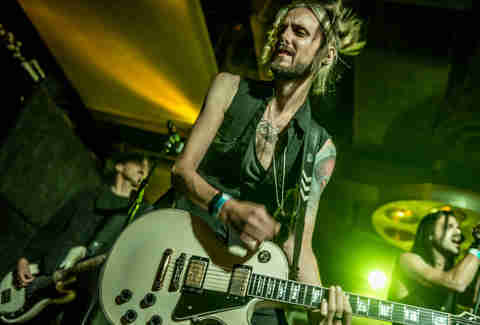 Former Morning Becomes Eclectic host Chris Douridas books this next-big-thing-focused night, which for years has become a showcase for buzzy acts like Knox Hamilton and Wolf Alice. The Whiskey's current bookings aren't on-par with their legacy as one of the great rock clubs in the country, but Ultimate Jam Night (which recently moved here from its first home at Lucky Strike -- see below) is trying to fix that, with a house band started by a dude from Quiet Riot and weekly all-star one-off performances that include members of bands like Great White and the Doobie Brothers. When Ultimate Jam Night moved from Lucky Strike to the Whiskey, the Hollywood and Highland Bowling Alley/music venue replaced it with another jammy cover night, with a house band playing classic rock and hard-rock covers (with the occasional foray into pop and hip-hop) with multi-genre sit ins from Avril Lavigne, Corey Feldman, and many more. Take a slew of studio musicians (including multiple Grammy winners), add singers from The Voice, and stew for this industry-heavy Tuesday-night showcase, which often finds reinventions of classic songs done retro-soul-style. Hot. 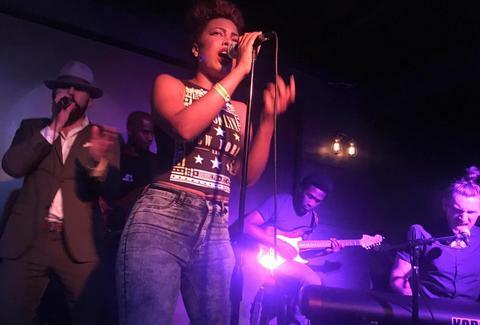 Following a similar format as their successful, rockinger Soundcheck Live on Wednesdays, Friday Funk's more wah-wah heavy, with a house band and a slew of guest vocalists and musicians every week. One of LA's best speakeasies is also one of its best jazz clubs, with a slew of touring musicians playing standards and more at the beginning of every week, sometimes with surprise sit-ins from luminaries like Kanye collaborator Jon Brion. This newcomer Highland Park bar's making a name for itself with live music nearly nightly, including a residency from Tortoise guitarist Jeff Parker on Mondays and funky jazz on Tuesdays. 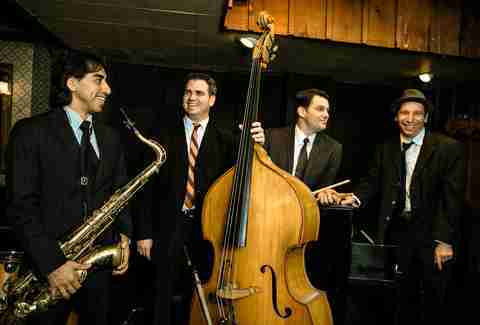 This Pasadena steakhouse also has a free Beatles cover-band night once a month, but if Blue Note-era jazz is your thing, head down on Sundays for toe-tapping from this quartet. This old-timey bar has free old-timey swing and ragtime on Tuesday and Wednesday and an old-timey jam on the first Thursday of every month. This trio of Cumbia DJs were given a nod by KCET for bringing a younger demo out to dance; their monthly parties are always packed. The Houston bros' resilient Cuban-themed bar has live music just about every night, playing Caribbean-and-Salsa-influenced Latin jazz while burlesque dancers shake-shake-shake throughout the bar; Tuesdays, the bar offers free salsa-dancing lessons. 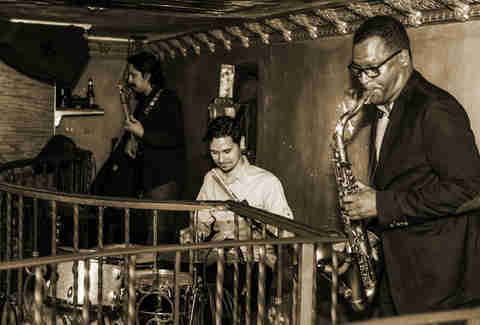 The NoHo staple gathers musicians for a funky Latin jam every hump day. Local singer-songwriter Chris Hawley is booking this new showcase happy-hour series, which means the talent's vetted by one of their own. 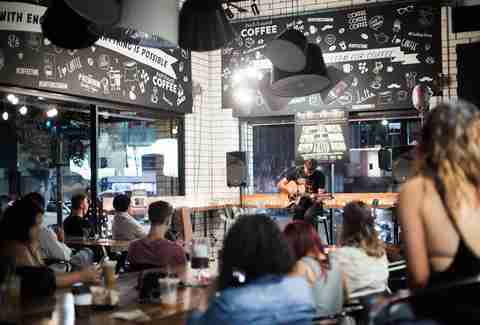 This two-years-and-running series works with music schools and scouts venues to lock down three emerging songwriters every week to play intimate sets. It may not be a line-dance honky tonk like you'd find in deep Texas (though, let's be honest, it would be amazing if someone opened one of those in LA HINT HINT HOUSTON BROTHERS) but Harvard and Stone (which has free indie rock most other nights of the week) does open itself up to y'alls and ma'ams at this Stetson-optional, regularly running free Sunday series. Jeff Miller is usually somewhere on the Eastside on Monday. Catch him at the Satellite or on Instagram.